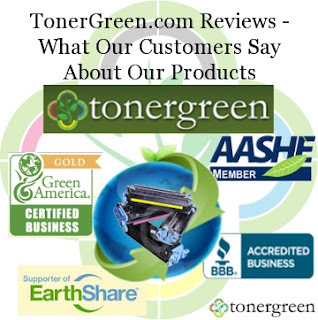 TonerGreen.com Reviews - What Our Customers Say About Our Products | TonerGreen - Eco-Friendly Toners from the U.S.
TonerGreen.com is an environment-conscious e-commerce shop that intends to provide environmentally responsible printing solutions for your home or office. It was founded in April 2009 under the name TonerforEarth.com. Since that day, TonerGreen has been providing a variety of value-added eco-friendly products that contribute to energy conservation, sustainability, and environmental responsibility. TonerGreen's primary product line includes U.S. premium made remanufactured toner cartridges and remanufactured inkjet cartridges. These remanufactured printer cartridges recycle used OEM cartridges to help reduce waste and conserve energy. But not because our products are recycled means their qualities are sub-par low than the genuine ones. Quality is strictly imposed every step of our remanufacturing process to ensure that our remanufactured toner cartridges meet, or even exceed, the printing performance and capacity of their OEM counterparts. Moreover, TonerGreen prioritize quality and customer satisfaction over low-cost and cutbacks, letting you save 50% to 70% on your printing expenses. We also offer coupons and discounts from time to time for you and our customers to save more money, and a two-year warranty on all our remanufactured ink and toner cartridges. "I enjoyed ordering from TonerGreen. I did not have a hard time plus the printer cartridges are really affordable. Thank you, TonerGreen!" - Gerard Hamilton, from Nextag.com, gave TonerGreen a 5 start rating. "At first, I was hesitant to buy a recycled toner cartridge but my advocacy to save our planet took over me. So far I am satisfied with the quality of remanufactured toner from TonerGreen. There is hardly any difference in the printout especially if you're only printing texts. The price is about 50% to 70% cheaper than OEMs. Since TonerGreen is an online store, order process is user-friendly. I also appreciate the free shipping." - Milo, from ReviewCentre.com, gave TonerGreen a 3 star rating. "This is my first time to try TonerGreen and I am impressed with the prints that I got. The prices are also affordable. I will order again next time." - Trina Gilbert, from Nextag.com, gave TonerGreen a 4 star rating. "I love the product! Even though it is remanufactured, I never noticed a difference in the ink quality. I'm organic so the fact that the product is green pleases me even more. Also, I received it in excellent condition and in time as I was promised. Great job. Keep up the good work." - Lynn Santaniello, from Nextag.com, gave TonerGreen a 5 star rating. TonerGreen.com, is the best choice if you want to help save the environment and save some cash on your printing supplies. There is no easy way to go Green than to start with TonerGreen.com.